Find Sedum at FiftyFlowers! Also known as Stonecrop flowers, this beauty is one of the more popular flowering succulents with clusters of tiny pink blooms. 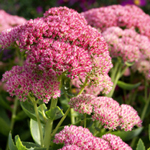 Folklore has said the essence of the sedum flower is a cure for broken and wounded hearts. This pink flower is a wonderful backdrop for focal flowers in any arrangement!